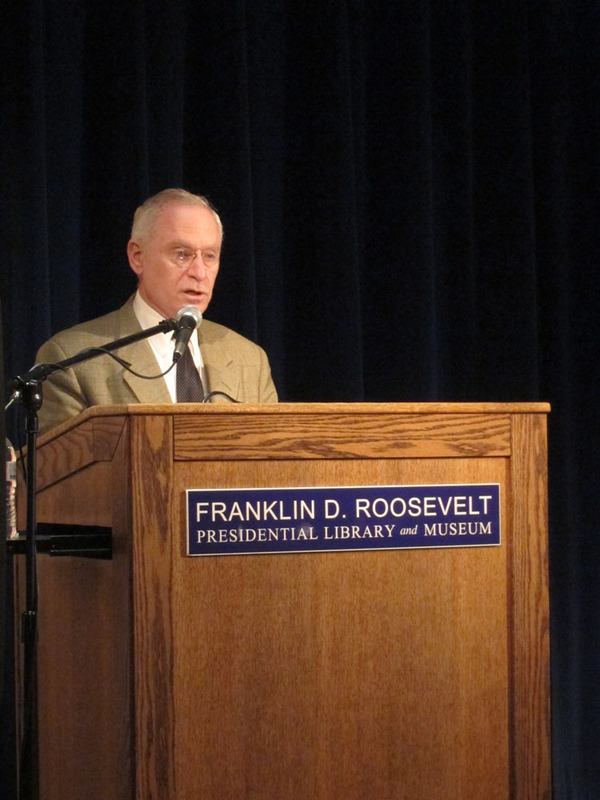 The Roosevelt Library celebrated President’s Day Weekend with a host of afternoon events last Saturday, February 18. Washington College Professor of History Richard Striner, author of “Lincoln’s Way: How Six Great Presidents Created American Power,” delivered a fascinating talk on Presidential power to an audience of 85 attendees. Following the lecture visitors were invited to view a selection of presidential autographs from the Roosevelt Library archives in the research room — many of which are from FDR’s personal collection. 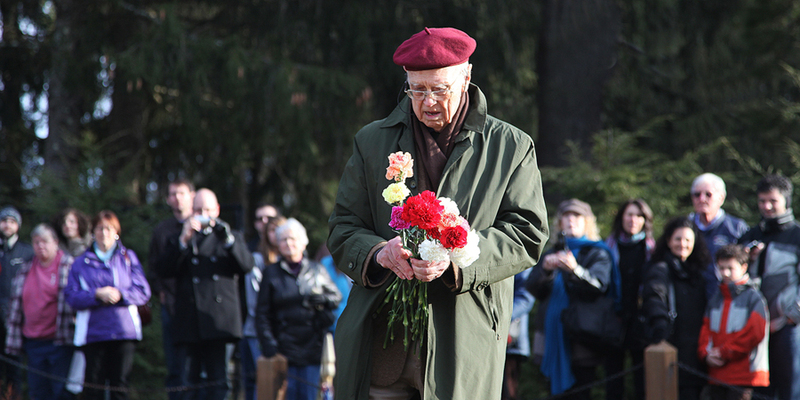 At 3:30 p.m., Roosevelt grandson Curtis Roosevelt laid flowers at the President’s grave and spoke to 75 attendees in the Rose Garden at the Home of FDR National Historic Site in honor of his grandfather on President’s Day. 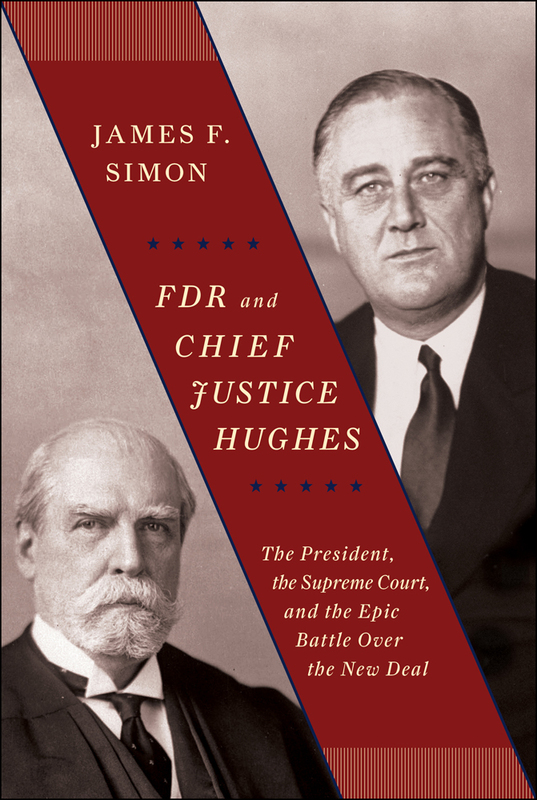 Next month, on Thursday, March 22, 2011, at 7:00 p.m., the Library will present an author talk and signing with acclaimed author and New York Law School Martin Professor of Law Emeritus James F. Simon, author of “FDR and Chief Justice Hughes,” in the Henry A. Wallace Visitor and Education Center. Following the presentation, Prof. Simon will be available to sign copies of his book. This is a free public event. 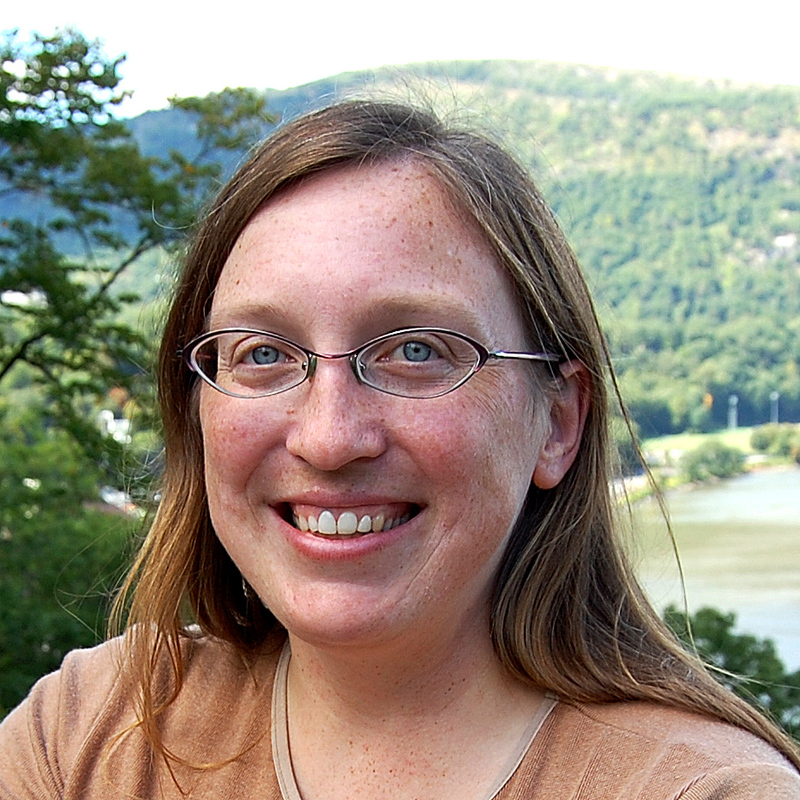 I am one of the most recent additions to the staff of the FDR Library, having started work as the assistant to Director Lynn Bassanese in May, 2011. After graduating with a B.A. degree in English Lit from Marist College in 1998, I enlisted in the U.S. Army to become a Linguist (98G) and went through Basic Training at Fort Jackson, SC. Since I’d studied Russian for eight years, I was surprised to find I was to learn Arabic at the Defense Language Institute in Monterey, CA. After over a year of intensive study, I graduated from the language portion of training (الحمد لله) but was held back from completing the second half of my AIT while Army physicians tried to diagnose and treat the anemia which resulted from what would years later be discovered to be Celiac Disease. In the end, I was given an honorable medical discharge from the Army. I moved back to NY and was hired as a civilian Army employee in the Protocol Office at the United States Military Academy. In working with the Protocol team to plan and execute meetings of USMA staff with some of the most influential people in the world (including foreign heads of state, Cabinet members and Senators) I had the opportunity to catch a glimpse into how world events transpire and to become curious about how the United States has historically fit into this puzzle. In 2006, I moved to mid-coast Maine to marry, buy a home and settle into a small, rural town that would be a good environment in which to raise a child. I worked with veterans at the oldest veterans’ facility in the country, the Togus VA. Due to a family situation, it became necessary to move back to NY in 2011 and I jumped at the opportunity to be part of the legacy of one of this country’s most admirable leaders. I’m so happy to be working here; I feel connections to the House and Library going back quite a while. I remember as a little girl standing out in the cold celebrating FDR’s birthday along with Arthur Schlesinger, Jr. and attending ceremonies in the Rose Garden on Memorial Day, once meeting Hamilton Fish, Jr. FDR’s sons were sometimes present. When I was a teenager, I babysat one of FDR’s great-granddaughters. 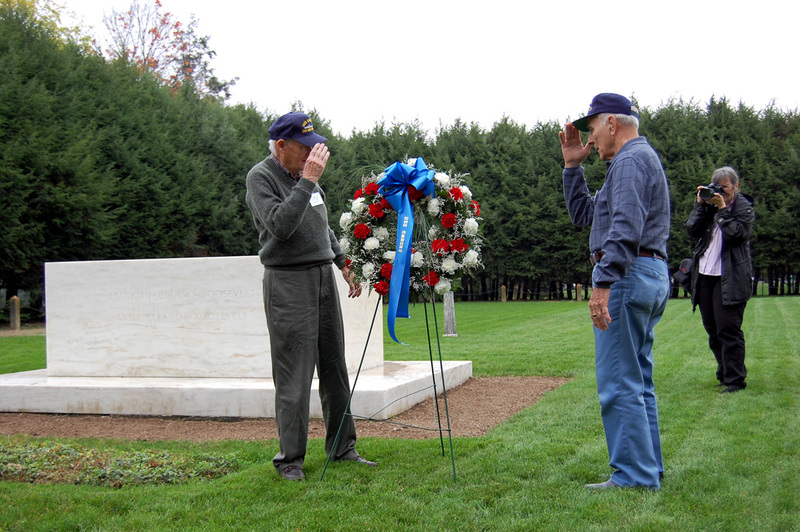 In 2007, World War II shipmates from my great uncle’s ship, the USS Emmons (instrumental in the success at Normandy on D-Day), visited the House and laid a wreath in the Rose Garden. 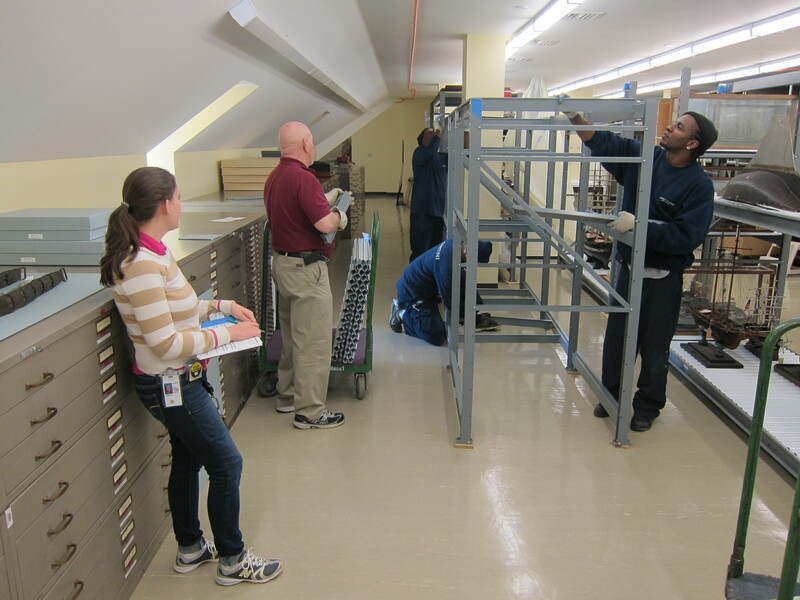 I look forward to working with one of the most dedicated and enthusiastic teams I’ve ever known to facilitate the renovation and continue FDR’s legacy. FDR wore this distinctive wool and velvet cloak during his trip to the Yalta Conference in the Crimea, Ukraine, in February 1945. 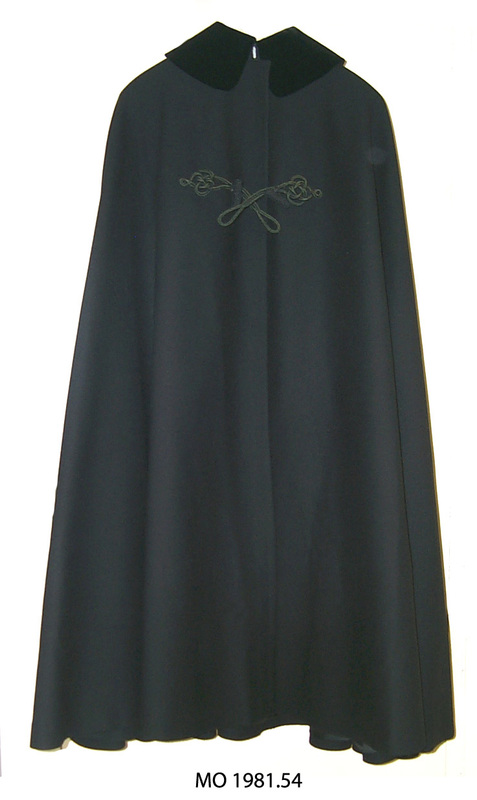 It is a U.S. Navy regulation officer’s boatcloak. Roosevelt wore similar boatcloaks during other trips he made during his presidency. The image of FDR in these cloaks is one of the most enduring of the war years. The cloak is designed to be worn during movement by a boat to protect the wearer from the cold and his clothing from the effects of spray. It opens at the front and is fitted with two frogs (knotted lengths of braided cord), which engage to secure the cloak closed. The relative ease with which such a cloak could be put on and taken off made wearing it an attractive alternative to a more conventional garment—especially for someone whose ease of movement was hampered by the effects of polio. This boatcloak was made at the Naval Clothing Depot at the Brooklyn Navy Yard in New York City in August 1942. It is a standard officer’s boatcloak, ordered and unaltered for FDR’s use. 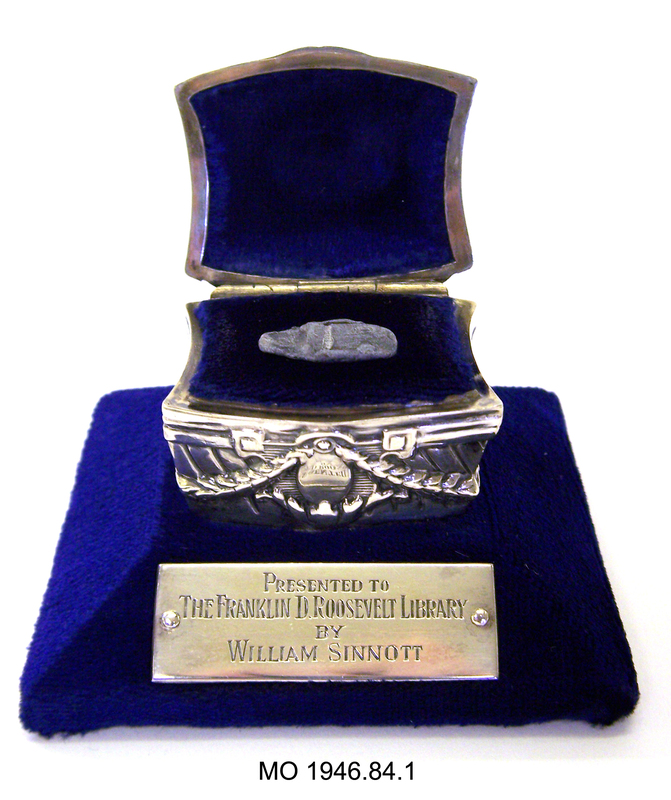 The cloak was donated to the Roosevelt Library by Franklin D. Roosevelt, Jr. in 1973. President Roosevelt can be seen wearing this cloak in a series of photographs below from his Yalta Conference trip. These photos and hundreds more can be seen in a new exhibit opening this Spring at the Franklin D. Roosevelt Presidential Library and Museum: The Roosevelts: Public Figures, Private Lives. February 2012 marks the 70th anniversary of the signing of Executive Order 9066. The decision to intern Japanese Americans is widely viewed by historians and legal scholars as a blemish on Roosevelt’s wartime record. Following the Japanese attack on Pearl Harbor, the FBI arrested over 1200 Japanese aliens throughout the United States. Over the next several weeks, President Roosevelt received contradictory advice about further action. But the shock of Pearl Harbor and of Japanese atrocities in the Philippines fueled already tense race relations on America’s West Coast. In the face of political, military, and public pressure, Roosevelt accepted the relocation proposal. The Attorney General acquiesced after the War Department relieved the Justice Department of any responsibility for implementation. On February 19, 1942, President Roosevelt signed Executive Order 9066 granting the War Department broad powers to create military exclusion areas. Although the order did not identify any particular group, in practice it was used almost exclusively to intern Americans of Japanese descent. By 1943, more than 110,000 Japanese Americans had been forced from their homes and moved to camps in removed inland areas of the United States. Please see our document packet on FDR and Japanese Internment for more information as well as documents from the FDR Library related to this topic. 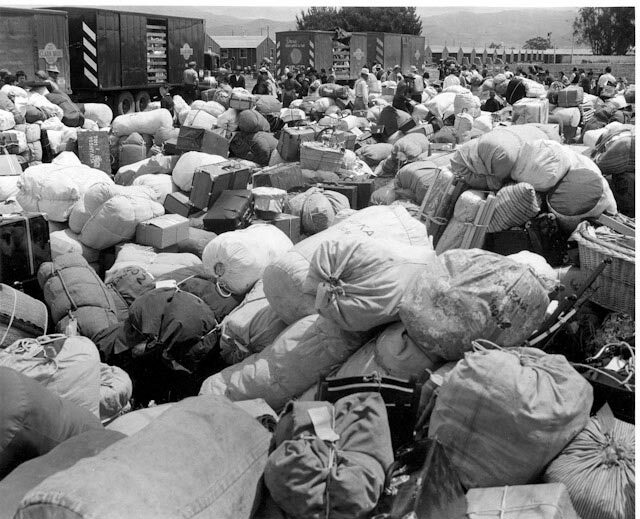 Pictured below is baggage belonging to evacuees of Japanese ancestry at an assembly center prior to transfer to a War Relocation Authority Center. This photograph was taken several months after the February Executive Order, on July 1, 1942.